Is This The Tastiest Recipe I’ve Ever Posted On This Blog? PROBABLY. | Keep It Up, David! Is This The Tastiest Recipe I’ve Ever Posted On This Blog? PROBABLY. …WASABI PEAS. I’m going through a wasabi pea kick. They’re my favorite snack right now. Wasabi is a Japanese horseradish – it’s the green stuff that’s served alongside sushi – and these peas are coated with a wasabi mixture and roasted. They have a spicy kick that can clear out your sinuses if you eat them too quickly! While they’re made from vegetables, wasabi peas aren’t a guilt-free endeavor. They’re pretty high in calories (120 per 1/4 cup), and while they have a fiber and a little protein, there’s not much more nutrition in there. Plus, the coating adds some fat, sugar, and salt. So, like most snacks, indulge in moderation. SIDEBAR! I want to encourage you to check out the grueling charity races I’m doing in the coming weeks, and ask for your financial support towards my fundraising goals – CLICK HERE! 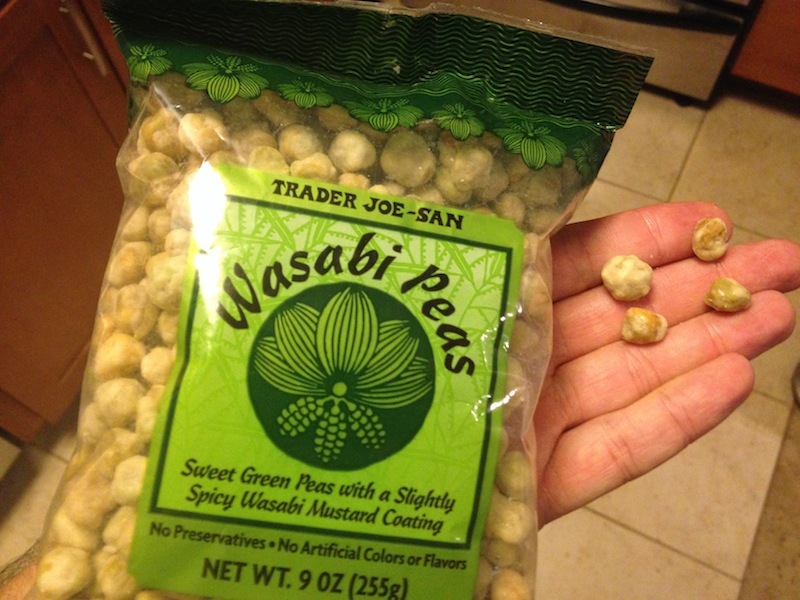 I love wasabi peas, and started thinking about what I could do with them besides eat them straight out of the bag. Then I had a light bulb, aha! moment… I could use them as a crunchy, flavorful coating on fish! 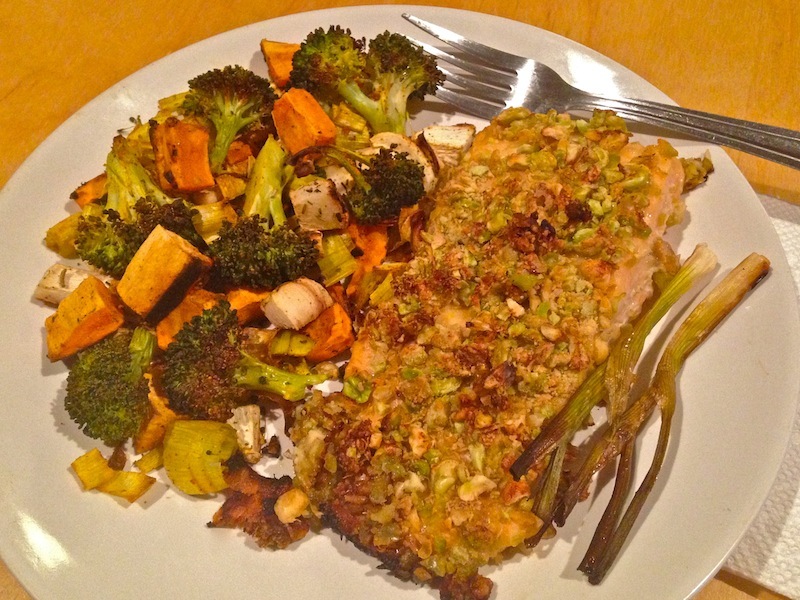 Without further ado, here’s my recipe for WASABI PEA-CRUSTED SALMON! the pale green stuff on the left is about 1 teaspoon of Trader Joe’s Wasabi Mayonnaise. The only reason we used it is because Tavi had it in his fridge, and that’s all that was left, so we used it up. 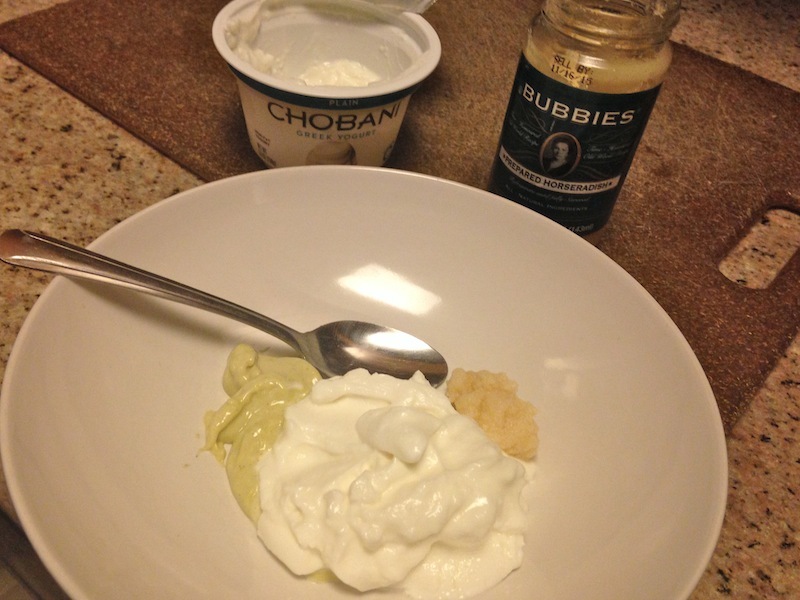 If you don’t have it, just leave it out, and add a little more yogurt. Just stir – that’s it! I set up a ‘wet hand, dry hand’ breading station for my salmon, which is something I’ve seen on Food Network a gazillion times, as a way to keep things orderly when you’re breading. 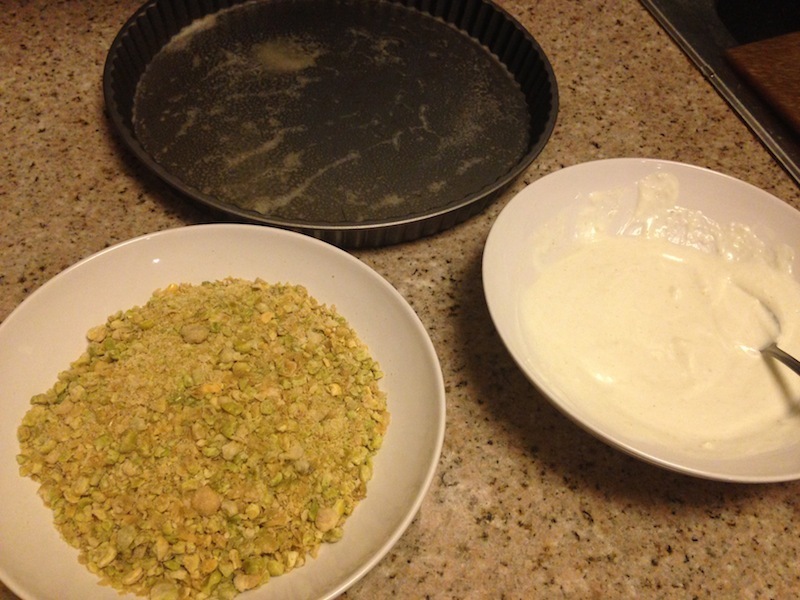 Yogurt in one bowl, crumbs in another, and a pan, slicked with nonstick spray, for the breaded fish. The salmon pieces are to the right. 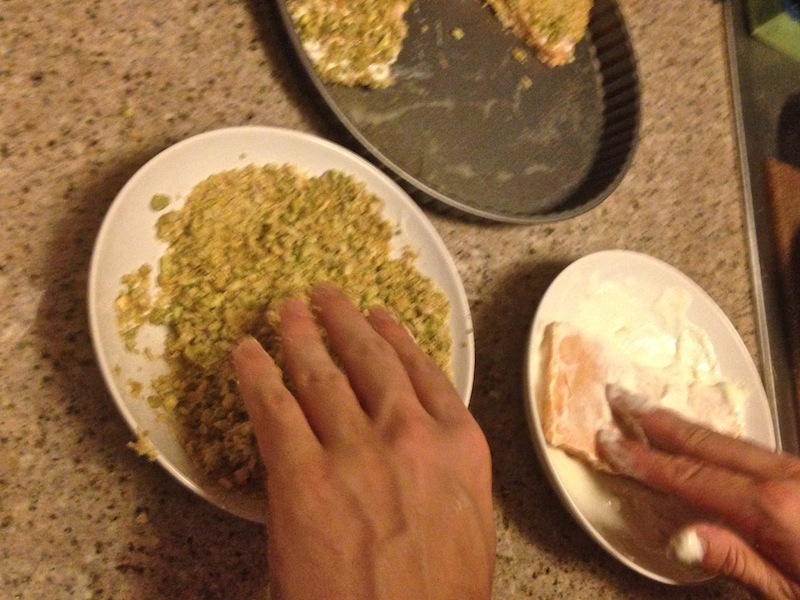 My right hand put the fish in the yogurt and made sure it was coated on all sides, then placed it in the crumbs, and my left hand patted the wasabi-pea crumbs all over all sides, and placed it in the pan. It was still a messy process for my fingers, but at least it was orderly! 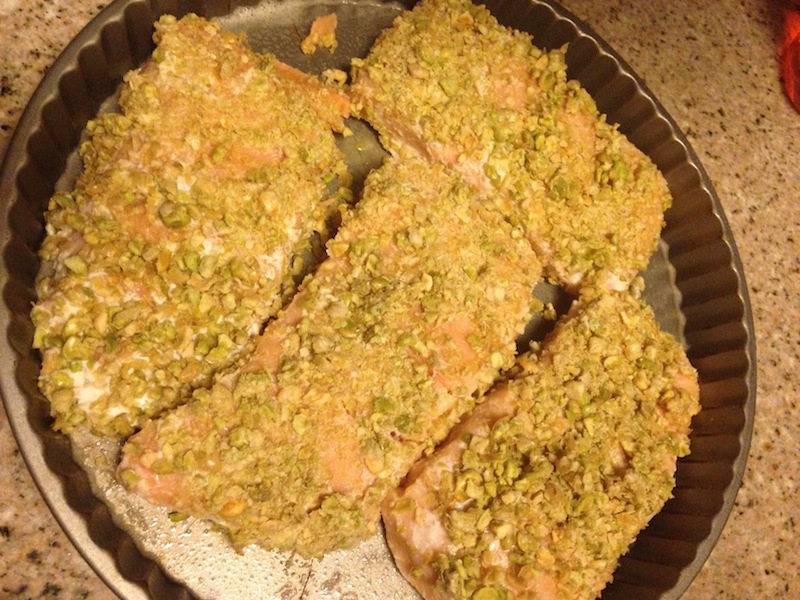 I did four salmon pieces, and each was 6-8 ounces. They went into a pre-heated 400 degree oven and baked for about 20 minutes, until they were cooked through and the crust started getting golden brown. Wanna see the final result? CHECK IT OUT! The fish was flaky, moist (thank you, yogurt), and the coating was crunchy. It was delicious. NO SERIOUSLY, IT WAS SERIOUSLY DELICIOUS. SERIOUSLY. And here’s the thing for all you folks that don’t like heat: It’s not that spicy at all. There’s an underlying smidgen of heat, but the salmon is so mild that it’s hardly noticeable. There is, however, a lot of flavor, and a lot of crunch, which I love. This is a great alternative to frying, and a great way to hit that fried-food craving that I get every once in a while. I wanna try it again, with chicken! A Note About The Vegetables: For a side dish, I roasted turnips, sweet potato, broccoli, and leeks – they were what I had lying around. They were in the same 400-degree oven, although I separated them on to two pans: turnips and sweet potatoes on one (because they took longer), and broccoli and leeks on the other. I also roasted a few scallions – to the right of the fish – as a little garnish. This entry was posted on Thursday, September 17th, 2015 at 12:19 am and is filed under Uncategorized. You can follow any responses to this entry through the RSS 2.0 feed. You can leave a response, or trackback from your own site. 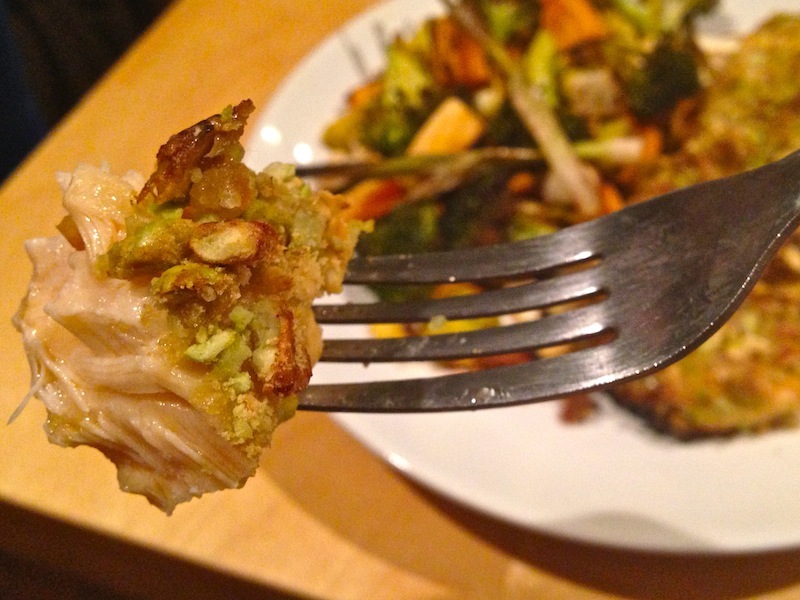 2 Responses to Is This The Tastiest Recipe I’ve Ever Posted On This Blog? PROBABLY. Good catch! Typo fixed. Thanks, Pat!